As the September 21st race date drew near, that fear of failure didn’t melt away like it has before other daunting races. I went into the Malibu Triathlon last year having never ridden more than 27 miles or having run more than 8, and at that point I could count my number of brick workouts on two fingers. I was woefully under prepared but knew that I could “grit out” what needed to be gritted out on race day. Likewise, my LA Marathon race prep was also a last minute patch job, squeezing way too many miles into too few days toward the end, and battling an injury that really should have been recuperated, not battled. But again, on race day, I knew that the job would get done because that’s what I do. Ironically, my race prep for Tahoe was the most structured, organized, and consistent training plan that I have ever undertaken, and yet, looming in the back of my mind was an overwhelming certainty that come race day, I still wouldn’t do it. I was right. I originally chose Tahoe because I thought it would be convenient. I had two conditions for a non local race — it either needed to be within driving distance, or take place in a location where I could stay with friends or family. I also knew that my weakness was the bike, so I wanted a late season race that would allow plenty of time to train up. Timing ruled out Oceanside, Wildflower, Galveston, and even Vineman felt too tight. After a tip from a friend, I had briefly considered participating in the 70.3 in Princeton (also on September 21st), but I soon realized that the logistics would make this tougher. Having all graduated, none of my friends still lived in Princeton, and the course focused more on the township than the university, where, in typical Princeton student fashion, I had never spent much time. 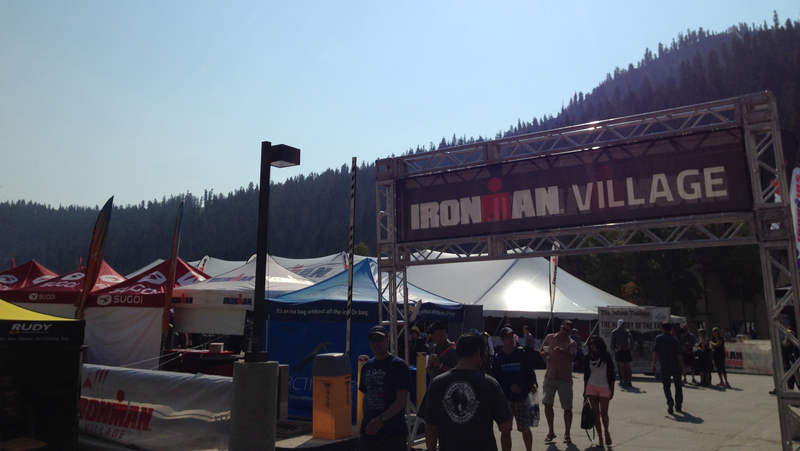 When the 70.3 at Tahoe was announced, it seemed like a sign to go for it. In my naive, early days of training I created a race fantasy in which I would finish strong and successful, having set a goal and worked methodically (something I have previously mentioned that I tend not to do) to achieve it. But then came the actual work. And worse than the work, the burnout. I’ve already described in detail my newly admitted lack of enthusiasm for cycling, but this distaste went beyond mere activity and bled into everyday life. After months of working 8:00pm shifts, I was exhausted at every 5:45am workout. After weeks of early nights, and weekend long rides, I had stopped seeing my friends outside of work. After a season of spending the hours between 6:00am and 9:30am training, then the rest of the day until sundown in a basement office, I felt disconnected from the world and couldn’t remember why I was doing this to myself. So I stopped. I went on vacation. It was like the start of a bad introspective movie — I went home to visit my parents in Texas. I remembered how to do things I liked. I read books. I started playing violin again. I watched trashy movies with my sister. I ate pizza. When I came back, I promised that I wouldn’t allow myself to descend to that point in overtraining again, especially with the end goal so near in sight. I participated in the Santa Barbara Triathlon out of necessity but was in a funk about it the whole time, not allowing myself to enjoy what actually was a fairly fun race. I had convinced myself that not training was the key to happiness. I slept full nights. I enjoyed coffee and books in the morning. I watched movies with my roommate without worrying about waking up early. I told myself that I would just make it until Tahoe, then start the search for balance. September 21st became my date of release. However, taking what I had started to euphemistically call an “extended taper month” had me worried about my actual level of preparedness. Had I grown soft? I had done a 70mile ride with canyon climbs, but that was weeks ago. Was I still as strong? This wasn’t just an Olympic distance tri or a mere marathon but a multi-hour, multi-sport event in a place where many had tried and failed just a year earlier. In the days leading up to Tahoe, the doubts only worsened. The horror stories from the 2013 race and the looks of shock from those who heard my race plans had painted Tahoe in my mind as an unforgiving land that crushes dreams and punishes dreamers. Like the Russian winter. Or Hollywood. 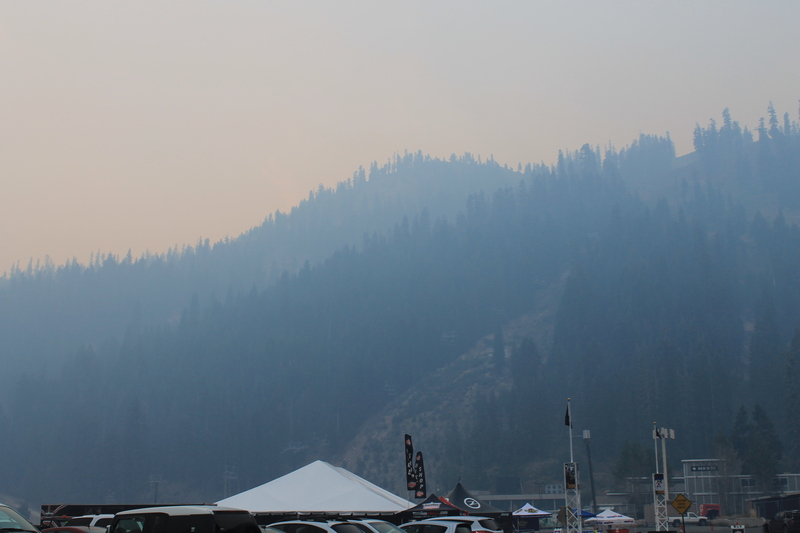 The rumors were now reporting that smoke from forest fires might obscure the course, but that any cancellation plans would be made on race day. Sure enough, when we arrived, the entire city was blanketed in a sea of smoke as dense as early morning fog. Our hotel room smelled like the ember pits of a campfire. If we made it through, it would be the race of fire and ice. We would be smelted Ironmen. Fortunately the smoke cleared during the first night, and by morning there was just the light scent of char on the horizon. I took a short run through the early morning fog, relishing in the delicious cold after sweating in the throes of an LA heatwave for the past two weeks. I instantly felt more at peace. This was the environment that had taught me how to be a runner — jogging through the smokey November woods of southern New Jersey, the light chill keeping my body cooled and focused. Later that day, my road trip buddy and aspiring triathlete took me on a short ride of the course, and I felt all of my hatred for the bike melt. I actually enjoyed it, for the first time in longer than I can remember. When someone asked me how I felt, I could finally reply with confidence that I was nervous but ready. An actual smile on the bike. Never before seen. What’s better, several friends from my Tower 26 swim group were participating as well, and it seemed that every time I left my hotel room, I bumped into one of them, fresh from a workout and offering tips for the best ways to check out the course. I had started to accept that I was here and that no matter how I felt, that I would be racing in less than 48 hours and that I could do this—that I would do it. I was backed by friends and coaches and even my dad who had managed to fly in from Texas to see me race. I couldn’t think of a better experience for my first half Ironman. 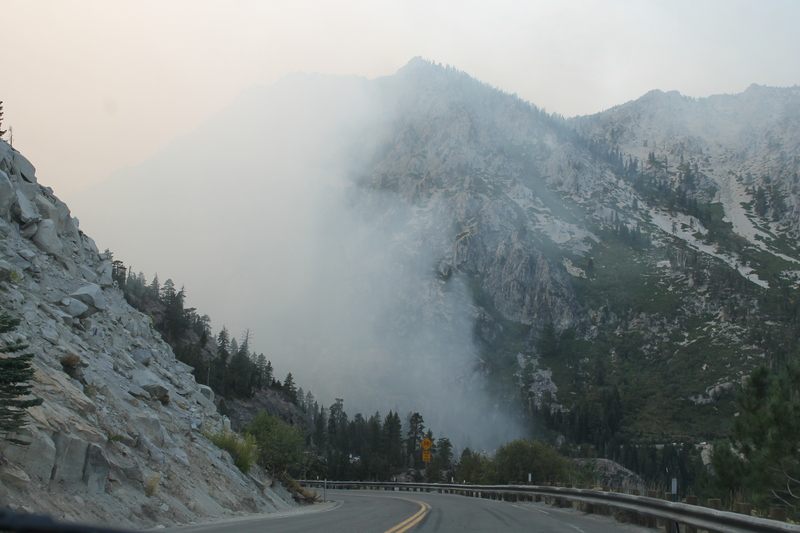 However, after a car ride around the Lake, my friend and I spotted the smoke creeping back over the mountains into Squaw Valley, and the race prospects turned ominous. But by then I was convinced that with the amount of money and publicity pumped into the event, that it would go on no matter what. At the time I wasn’t thinking about air quality or “particulate matter” or the future of my lungs over the next ten years. 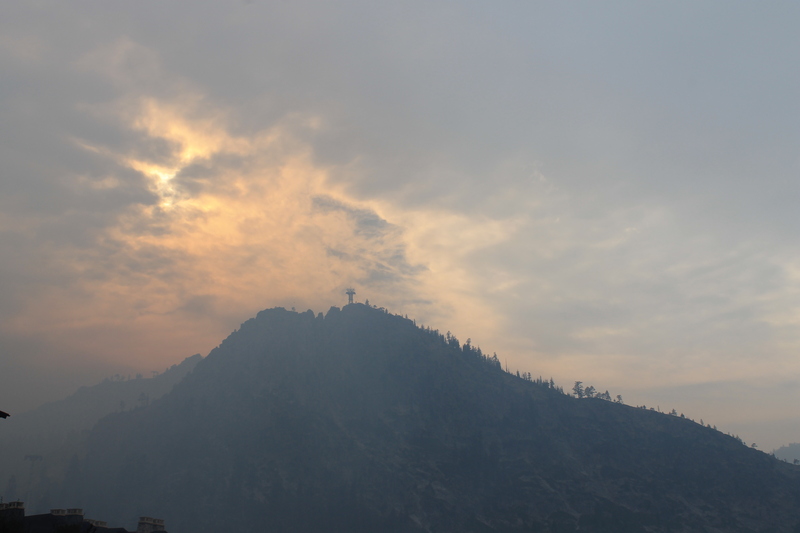 I had also lost perspective, not recognizing that hundreds of thousands of acres of land and homes had burned away, but that as long as the smoke didn’t come near us, everything would be fine. Even as I woke up during the night, my room smelling like a backyard barbecue pit, I just thought about Everest climbers at base camp who had to endure much worse, sleeping in tents filled with the putrid smoke of yak dung to keep warm. Compared to them, I had it great, and a little smoke, a little cold, a little altitude was no excuse not to crush this race. Unfortunately, I had started to let my adrenaline-fueled need to “grit it out” override my faculties for common sense. I was also pushed by a blind trust in the race officials, who I was convinced were concerned for my safety above all else and that if they were willing to allow the race to proceed then I would be all right. But in the end, the race did not proceed. I was getting ready in transition when the announcement came over the speakers that the smoke over the course had been deemed “hazardous to human health” and that the race would not take place. I cried. All of the factors that went into ultimately making this a good decision were lost on me at the time. In the moment, I was thinking about my friend who had driven 10 hours with me and had stayed up late working a stellar pace plan for the bike. I was thinking about my dad and the first triathlon I saw him race and how he would finally have the chance to watch me. Most of all I was thinking about how finishing this race was supposed to be the light at the end of a grueling race season tunnel and how without a definite conclusion, I would feel adrift and unresolved. The rest of the day dribbled on. My dad decided to go back to his hotel and pack after a few hours of the two of us bumming around town, eating food, and making jokes but ultimately sitting in deflated silences. My friend and I put on sweatpants and watched trashy movies in the hotel room. Some racers decided to ignore the warnings and attempt the course solo, with no aid stations or police support, and I hope that none of them have been adversely affected by the conditions. But in the end, it was the camaraderie of the sport that made the most of the trip. A few options have been thrown out as a path toward resolution, and it’s looking like the LA triathlon community will have a strong presence at Ironman Boulder next August. If I decide to join, I would likely bypass the option for a 70.3 and take the plunge into a full. 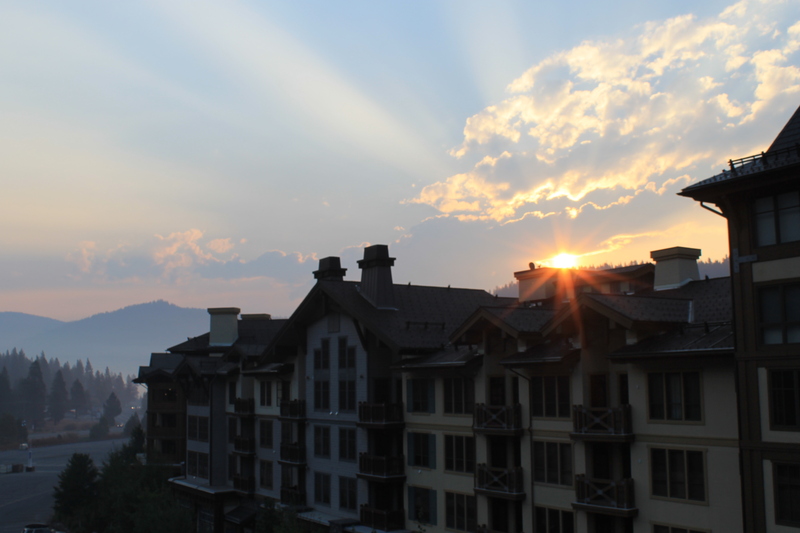 The memory of Tahoe will linger as a painful one, and even though it tends to be my nature to attempt to overwrite painful memories of painful places with positive experiences, I’m feeling a strong desire to simply leave it and move on. The clearest feeling that I have is of not being finished. 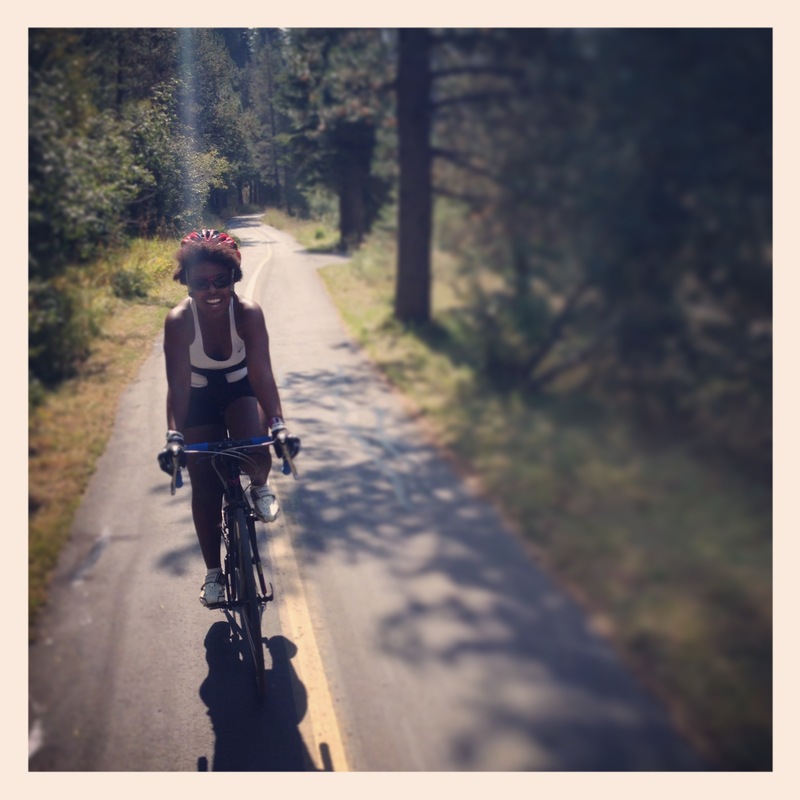 It was originally my intention to “never ride the bike again” after Tahoe, and as a result, never give myself the chance to get good, or to enjoy it the way I did that first morning in Tahoe. Maybe this did happen for a reason, and maybe that foreboding fear of incompletion stayed with me because I knew that I would need the chance to try again. Bye Tahoe. It’s been real.